Does your child struggle with learning vocabulary words? Do you feel as if they are memorizing definitions without learning to use new words in their daily life? It is actually easier to teach a child the meaning of a word, than to teach them to use the word. Working through word lists and definitions can expand the 2000 words your child understands, but it does not follow that this new vocabulary will be transferred into the comparatively small group of words they use themselves. Childhood is unquestionably the best time to learn language skills, but encouraging children to make use of the language they have learned can be difficult. Sheep Among Wolves is offering the Word of the Week (WOW) program to help you make the best use of your children’s most teachable years. What is Word of the Week? Word of the Week is a FREE vocabulary program intended to teach 36 new or unfamiliar words in the course of the school year. The idea of the program is not to provide words and definitions to be committed to memory, but to encourage students to incorporate new vocabulary into their daily life. I discussed this concept last school year, in How To Boost Your Child’s Vocabulary In 36 Words. This post suggested picking one new word to focus on each week as a part of your school curriculum. This term we are offering a complete Word of the Week program, based around Bible words that can enrich our vocabulary today. This provides a twofold benefit. 1) Your students will take in 36 words to help them communicate more effectively in their daily lives. 2) They will also become familiar with 36 words that are used in the King James Bible, but which we sometimes scan past without really understanding. How Old Does the Student Need to Be? WOW is geared to children from grades 4-8, but it would be equally appropriate for both younger and older students. Children who would find the word too long to read or spell, can often still learn new vocabulary words orally. Older students can derive equal benefits from studying a word that is somewhat familiar, but not in daily use. This is really an activity for the whole family. SAW Publishing’s Word of the Week is meant to require as little teacher preparation as possible. If you only have time to print off the weekly word and scan over the page as you walk to the kitchen table, that is just fine! How Do You Use WOW with Other English Programs? One new word a week is sufficient when it comes to incorporating the word into a child’s daily vocabulary. But obviously, this doesn’t constitute an entire English course. WOW is meant as a supplement for whatever language program you are already using. The weekly words can be used in conjunction with the English vocabulary supplied by your base course, or it can form a replacement for some of the words. If your English period is already full, consider using the Word of the Week as a penmanship exercise. The Bible Verse, Webster’s Definition, Poem or Hymn, and Examples from Daily Life all provide substantial text for copy work. The Examples from Daily Life are short vignettes involving the same characters each week. The Gravesend family will help you see how new vocabulary words can be used in everyday situations, while their ongoing story is an incentive to look forward to the next week’s lesson. The 36 WOW lessons were posted on the Sheep Among Wolves Blog between August 26, 2016 and May 26, 2017, and may be accessed through the “Archives” button in the sidebar. If you would prefer to receive the lessons by email, you can sign up below to have the lessons delivered weekly to your inbox. Email signup includes a high resolution copy of the image for those who wish to print it out in poster form. If you have any questions, please contact us in the comments section at the bottom of this post. This post may have been shared with the following linkups: The Art of Homemaking Mondays, Monday’s Musings, The Modest Mom, Titus 2 Tuesday, Tuesdays With A Twist, Hip Homeschool Moms, Homemaking Wednesdays, Wise Woman Linkup, Coffee and Conversation. Thanks, Jes! We’re glad to have you joining us. 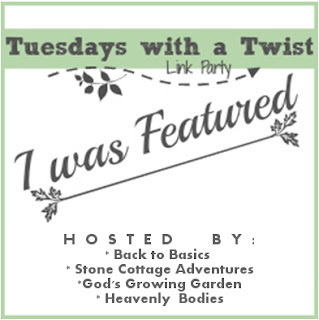 I am so delighted to be featured us on Tuesdays with a Twist! Hope you (and your kids) enjoy the WOW program. Thanks for joining us! Thanks, Marci, I like your pun! It has been a fun program to put together, (although a challenging one, too.) The Bible verses haven’t been particularly hard to find, but matching them up with a hymn has been much more difficult. I’ve found some good hymns along the way, though!